When you’re checking out a Lead in salesforce, it’s handy to be able to click the Website field to go to the Lead’s company website. But what if you don’t have the website field populated? And let’s be honest, it’s rarely populated. This nifty link will use the Email and Company fields to “seek” the website for you! The basic premise is that even though you don’t have a website on the record, you usually have enough information available to find the website pretty easily. For example, I know I usually check out the email address of the Lead as it most likely contains the domain of the website. 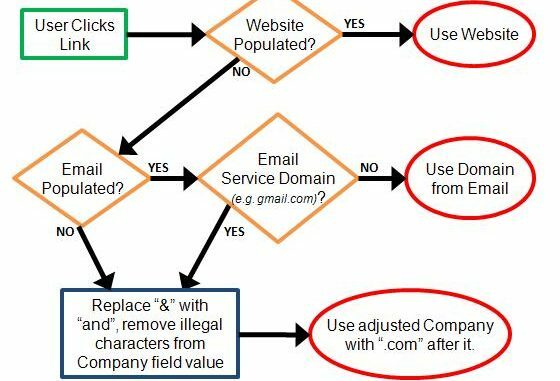 So that’s what the product of this recipe does, checking first to ensure the domain is not a common email service domain like “gmail.com” or “yahoo.com” for example. When it hits one of these generic domains, or if the Email field isn’t populated, then it makes a best guess using the Company field, since this field is required. In order to make a guess at what the website might be using the Company, it swaps any ampersands with the text “and” and then it removes all other special characters that are not allowed in domain names. Lastly it slaps a “.com” at the end. So, for example, a Lead with a Company of “Bed, Bath & Beyond” produces “bedbathandbeyond.com” by this method… not too shabby. I will provide the instructions for creating the “Website Seeker” link on the Lead object, although by simply modifying the merge fields in the code below you could make it work for Contacts or Person Accounts. Then go try it out on a bunch of Leads… makes a great party trick! to this matter, made me personally consider it from numerous various angles.